Home > Heart Conditions > What is Myocardial Infarction? 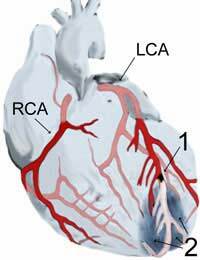 Otherwise known as a heart attack or MI, a myocardial infarction occurs as the coronary arteries become blocked. It can lead to sudden death very quickly and should always be considered an emergency and immediate medical assistance should be sought. What Exactly Happens During a Myocardial Infarction? The arteries that supply the heart muscle itself are known as the coronary arteries and if one or more of these become narrowed or blocked the heart muscle is deprived of blood and therefore oxygen, leading to the tissues becoming oxygen depleted and a heart attack occurs. If immediate action is not taken to unblock the obstruction, the tissue can die; if the artery is unblocked, the damaged tissue becomes scar tissue. What Causes a Myocardial Infarction? Many cases of myocardial infarction are caused because of a blood clot becoming lodged in the coronary artery; these clots are called thromboses and form because the artery has become narrowed. The narrowing occurs as a result of a build up of plaques in the arteries, which rupture, releasing fatty substances into the artery encouraging blood clots to develop. The plaques usually develop from having an unhealthy lifestyle, smoking and a diet high in fats and cholesterol. Other more rare causes can include trauma or injury to the heart, whereby bleeding can occur causing a clot to form. The most obvious sign that a myocardial infarction is occurring is acute pain in the chest. This pain is normally very severe and can incapacitate the person.The pain is usually centrally located and radiates towards the left side and down the left armThe person will often be seen to be ‘clutching’ their chest and may seem breathless. They will often collapse to the floor or even faint. Sudden death can happen during an MI if the symptoms appear severe. It is imperative that any types of chest pain are treated immediately and medical advice and help should be called for if someone suffers any chest pain. Treatment for an MI will include immediate attention to the airway ensuring the person is breathing and has access to oxygen.They will then normally be given pain relief and drugs to try and reduce the clot and the ‘stickiness’ of the blood. Diagnosis will be either confirmed or ruled out by performing a series of tests such as ECG, X-ray, blood pressure, blood tests and basic monitoring.The heart will be monitored over a period of time and advice given regarding medication regime and lifestyle choices that can prevent further attacks. For some, the recovery from an MI can be full and normal activities can resume allowing the person to make changes in their life in order to try and prevent a further occurrence, for others, the MI could suffer from longer term consequences such as heart failure or cardiac arrhythmias. Myocardial infarction is a very serious occurrence and can cause death if not treated immediately. Anyone witnessing a suspected heart attack should call an ambulance straight away.Providing the correct treatment is given and the person receives it soon after the event, they may well make a full recovery.